First, I'd like to say thank you and welcome to the many new followers that starting reading my blog in the last few days. Hi there! I really hope to get to know you all, I love making new friends. I don't bite at all, honest! So feel free to say hi on Twitter or shoot me an email. I've seen this polish pop up a lot lately, and I'm thrilled. Why? For the last year or so, this polish has sat in one of my boxes, completely unloved. Now that lots of people have been using it, they've come up with lots of really attractive ways to wear this polish which I had never discovered. L.A. 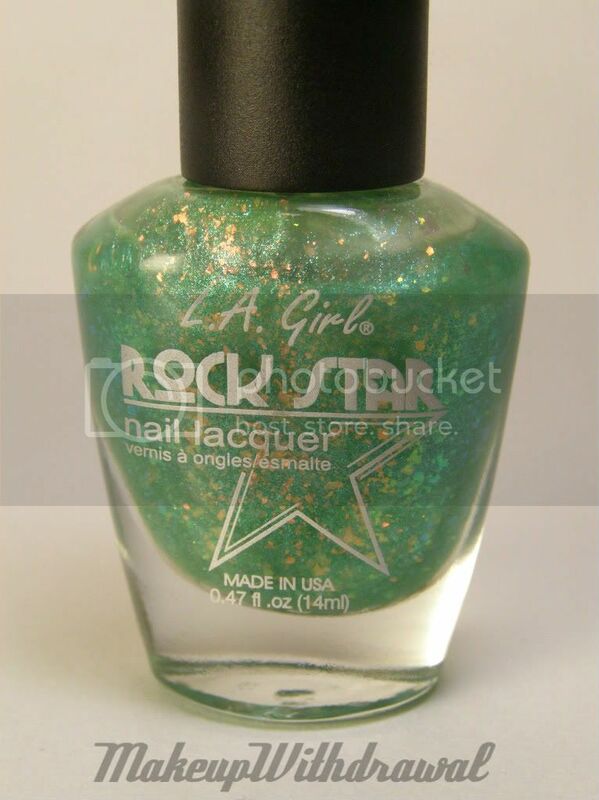 Girl Rockstar polishes are all spectacular in their own way, every shade has glitter, flakes, duochrome shimmer, something that makes it extra badass. This is no exception. Crowd Surfing is a sheer pistachio green has both flakes and fine shimmer in it. Too sheer to wear on its own. Pretty neat for layering or frankening. I saw it on NailPolishForum or MakeupAlley layered on top of a mint green and liked it quite a bit*. So I duplicated this look by layering two coats of Crowd Surfing on top of Funky Fingers Southampton Seafoam. I like it much better like this, subtle winks of flakes much more than I like it on top of black. I think it's because layered on black, the shimmer bits show up more... and I'm kinda anti-shimmer+flakes being friends (blasphemy of the worst kind, I know). That's why I don't own OPI Merry Midnight or that new Orly look-a-like. I also saw a really cool franken on NailPolishForum of Crowd Surfing mixed with Funky Fingers/Color Club 220 Volts*. Also- I'd like to mention that Forever 21 carries this color too, under their Love & Beauty brand if I'm not mistaken. *indicates that I read a lot of posts, and sometimes I forget who or where I saw these cool ideas being displayed. If it was you, don't be shy! Let me know so that I can give proper credit where it's due. Do you own this interesting and unique color? What have you done with it so far?